All Cylinders are tested by DV Diving's fully qualified and experienced IDEST Cylinder Technicians to standard BS EN ISO 18119. Diving cylinders should undergo a visual inspection every 2.5 years and a hydraulic test every 5 years from it's date of manufacture. During Visual Inspection the external and internal surfaces of the cylinder are examined for flaws/damage and the surfaces will be appropriately cleaned as necessary. The cylinder and valve threads will be checked for form and wear using plug and ring gauges. These gauges require annual certification for conformity. Before a cylinder is hydraulically tested it has to pass a visual inspection. Then it is filled with water and subjected to its test pressure. The technician verifies and records using a test gauge (which is checked for calibration monthly) that it returns to its original volume, within limits. Now the cylinder is dried, reassembled and filled with clean air to its working pressure. 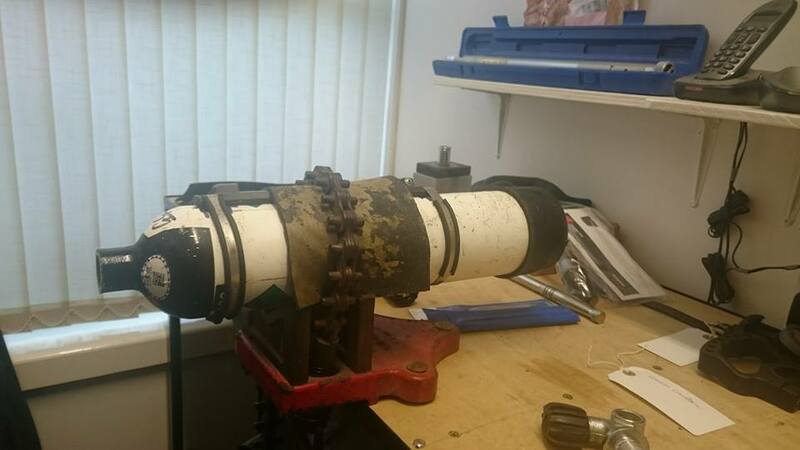 DV Diving use the latest optical, electronic and mechanical equipment to ensure that your cylinders can be inspected, tested, cleaned and dried to the highest standards. £10.00 if this is being done at the same time as an hydraulic test.